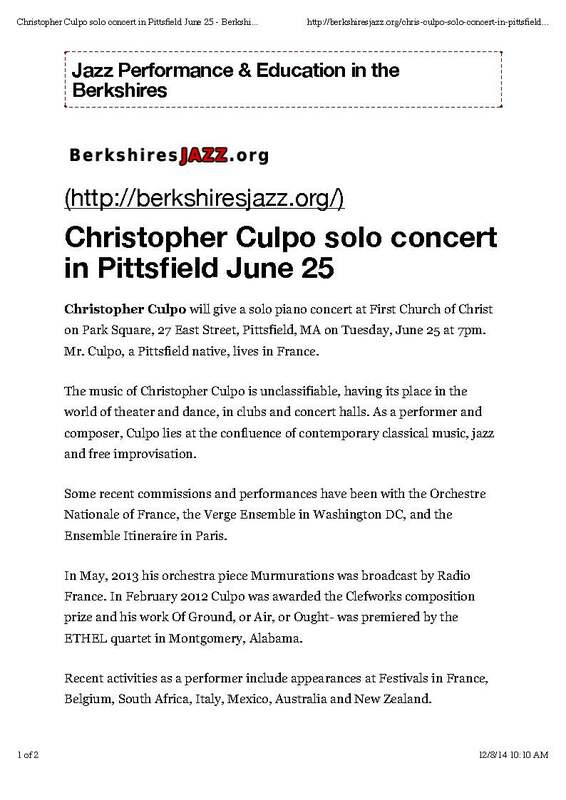 Christopher Culpo will give a solo piano concert at First Church of Christ on Park Square, 27 East Street, Pittsfield, MA on Tuesday, June 25 at 7pm. Mr. Culpo, a Pittsfield native, lives in France. The music of Christopher Culpo is unclassifiable, having its place in the world of theater and dance, in clubs and concert halls. As a performer and composer, Culpo lies at the confluence of contemporary classical music, jazz and free improvisation. Some recent commissions and performances have been with the Orchestre Nationale of France, the Verge Ensemble in Washington DC, and the Ensemble Itineraire in Paris. In May, 2013 his orchestra piece Murmurations was broadcast by Radio France. In February 2012 Culpo was awarded the Clefworks composition prize and his work Of Ground, or Air, or Ought- was premiered by the ETHEL quartet in Montgomery, Alabama. Recent activities as a performer include appearances at Festivals in France, Belgium, South Africa, Italy, Mexico, Australia and New Zealand.